Jon was impacted by his time serving with Hands at Work in Africa last year. He knew he must do something to continue to make a difference with his life and the lives of vulnerable children in Africa. 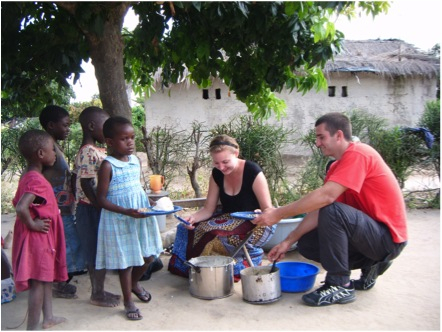 Jon Mycio, from London, Ontario, Canada visited Hands at Work in Africa in 2011. While Jon was serving with Hands at Work he sowed in to communities in South Africa and Zambia while the experiences he had sowed something deep in him too. Back in Ontario Jon felt challenged to continue having an impact on Africa’s most vulnerable children, and he turned to his closest friends for help. Jon was part of a weekly bible study group at College with other student friends. One day he decided he was going to ask them to join him in giving a small, weekly gift towards the work of Hands at Work. So Jon and his friends, each week when they met, started opening their wallets and emptying their pockets of loose change and bills. Each week they would take whatever money they had on them and put it in a bowl. Then they decided that they wanted to not only do that but also sacrifice one thing a week – like a Subway sandwich or Starbucks coffee – and add whatever that would have cost them to the money they were collecting. Over time, Jon and his friends saw their gifts growing. Through small but frequent giving, Jon and his friends had collected well over $2000 Canadian dollars, and the money was still coming in! Jon connected with the HandsJon Mycio with his Bible Study who are giving loose change and sacrificing student luxuries so that children in Malawi can have a better life. at Work office in Canada to find out how the money raised could be used, and it was then that he learnt about the community of Mngwere. Mngwere is a poor and remote community in central Malawi where orphaned children like 15-year-old Molian, are often forced to forego school in order to work. When Mngwere’s local volunteer care workers began caring for Molian, they convinced Molian and his aunt that it is important for Molian to go to school to secure their future. They had started a school and ensured Molian got enrolled. Today he is a proud student attending school everyday and receiving a nutritious daily meal at the care point. Jon and his friends raised enough support to care for 20 orphaned children like Molian in Mngwere, Malawi.